Pretty much South Africa’s Zambezi River. Runnable all year, high class and fast, gorge like, clean and action guaranteed! Only difference is, it is icy cold and of course, much smaller in volume. The town of Clarens adds to the experience a great big deal too. In the morning you will be out there in the freshness of the Free State. In the afternoon you will be back in town for any combination of pizzerias, burger experts, coffee shops, pubs and whatever else this hip town has to offer. A ten out ten day out on the river! 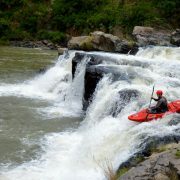 Region: Ash River (Clarens, Free State). 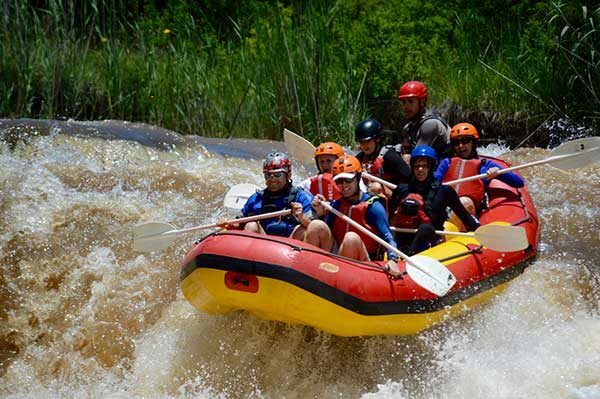 What you will get: All equipment and guiding, transport to and from the river (from Clarens) and lunch. Please note, you have to get yourself to Clarens. When to go: Year round. 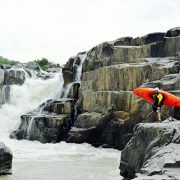 It is the only river in South Africa with good water 365 days of the year. White water action guaranteed! Itinerary rating: Intense. Children younger than twelve years of age will not be permitted to take part. You will need sun block and extra drinks for on river. The Ash River’s water is always below 10 degrees Celsius. In other words, always cold! During winter a wetsuit is required (this can be arranged if you do not have one). During summer your regular swim wear is sufficient, the same as what you would wear to the swimming pool. Shoes are recommended. Don’t bring running shoes. Use something like sandals that fasten around your feet. On a rainy or overcast day it can get cold on the river (especially in winter), even in high summer! A light wind breaker or something similar is recommended. Don’t bring heavy and bulky clothing. A t-shirt (preferably not cotton) can be worn underneath your life jacket. It helps keeping sunburn to a minimum (during summer). Dry clothing for after the paddle. Definitely warm clothing for winter paddling.